2003 Marks the 10th Anniversary of Beanie Babies! 2006 Marks the 20th Anniversary of Ty Inc.! Ty, Inc. was incorporated in 1986, Ty has donated millions to charities, Ty Warner is known as a marketing Genius, there are 9 original Beanie Babies, Ty has made over $6 billion selling plush toys! 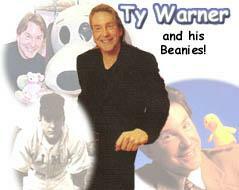 To this day Ty Inc. is still a privately owned company (no public stock) owned by Ty Warner.